I will say that I do appreciate great acting and fresh content off not-so-fresh facts about a pioneer female battle rapper who had success very early in her career. 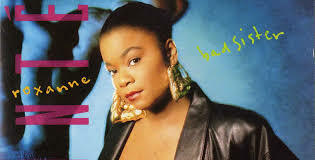 For those who are like me,(who don't anything) Roxanne Shante is the first female battle hip-hop rapper to have a single hit record in the 1980s, a genre widely known to be male populated. At 14, she was also the first to start an actual rap beef, known as the Roxanne Wars. The movie Roxanne Roxanne depicts the life of her childhood and her rise to the top. The movie stars breakout star Chante Adams who plays Roxanne alongside Academy Award Winner Marshallah Ali and Nia Long. Aside from being known for her confrontational and provocative records, which in retrospection, is ‘quite nice” and ladylike” given the highly sensitive trajectory rap-battles tend to take in the last few years, the movie also focuses on the not-so-pretty side of Shante’s life growing up the Queensbridge Projects, New York. Helping her depressive alcoholic mother (Nia Long) raise the three sisters, finding independence financially, being a mother at 15 and much later overcoming domestic abuse are some of the highlights in the story. Altogether, Adams does a pretty convincing job depicting a tough but confused teenager who must grow up quickly with nothing but a skill and no direction. I should mention here that this is her first acting role. Go 'head sis! For black kids everywhere, African-American, African or Caribbean,we can relate to constant tough love and tough talk that can be relentless and overbearing. Most of our teen experience is half spent rolling our eyes and simply feeling misunderstood. However, in more than rare moments, there is an understanding that transcends beyond age and experiences for both parent and child. In the ending scenes, Shante and her mother share a moment of vulnerability that spells a common understanding. The movie also highlights a prevailing trend in the early hip-hop and RnB era that exploited female rappers in unfair business arrangements. Roxanne was the first hip-hop artist to go platinum with about 250,000 copies of her first album sold in New York alone. She got nothing, however. This is a familiar outcome for subsequent black singers and rappers who started out young too in the early 80s and 90's. The movie isn’t going to wow you. It isn’t going to have you standing up and clapping. But you are going to connect with it. It is enjoyable in a way that leaves you proud of Roxanne Shante, reflecting on the staggering challenges she had growing up. Individually, however, the lead actors were pretty great. Chante Adams is showing much promise as a serious actress and I can’t wait to see her in varying roles. More importantly, it is about time more black stories are told. There’s an exciting wave of not just diversity in roles and content but also that stories that celebrate black achievement are highlighted. The awesome thing about that is, it's only just getting started. And we are here for it.